The SKILSAW SIDEWINDER is the only circular saw with a convenience brake and all magnesium housing. The electric brake quickly stops the blade so you're ready for your next cut, making you more productive while the rugged magnesium motor housing keeps the motor cooler to give you powerful performance for a lifetime. Legendary SKILSAW worm drive inspired technology has been integrated into this SIDEWINDER with our best-in-class Dual-Field Motor to provide reliability and durability. Top it off with a brake and the 56 degree precision beveling capacity and you will be unstoppable. It also comes with a Diablo blade so it's ready to work hard, out of the box. The DWE575 Dewalt circular saw is one of the lightest in its class at 8.8 pounds. With its 15-amp motor, powerful enough for even the toughest applications, and its anti-snag ball bearing lower guard providing smooth guard operation and long life in harsh environments, this lightweight saw is ideal for slicing through lumber and hardwood. A tough cord provides longer durability against cord pull outs while an integrated dust blower function cleans the line of sight during cutting. The DWE575 Dewalt circular saw is equipped with a durable high-grade aluminium smooth base for accurate cuts. Makita, a pioneer in brushless motor technology and battery innovation, combines both in the 18-Volt X2 LXT (36-Volt) Lithium-Ion Brushless Rear Handle 7-1/4 inch Circular Saw (DRS780Z, tool only, batteries and charger sold separately). It's powered by two 18-Volt LXT Lithium-Ion batteries for maximum performance and has an electronically-controlled BL Brushless motor that matches torque and RPM to the application. Makita 18-Volt X2 means freedom from the cord, even for demanding applications like cutting sheet and dimensional lumber that traditionally called for a corded saw. Best of all, users can remain in one battery platform, using the same fast-charging 18-Volt batteries with the DRS780Z as they use across the expansive Makita 18-Volt LXT cordless tool series. The DRS780Z has a long list of features for efficient cutting without the cord. Users of leading corded saws will appreciate the blade-left rear-handle design. The M18 REDLITHIUM HIGH DEMAND 9.0 Battery Pack delivers up to 5X more run-time, 35% more power, and runs 60% cooler than standard 18-Volt lithium-ion batteries. The battery is best optimized for high draw products and sustained run-time applications, and it provides the next, large step towards full corded replacement. The M18 and M12 Rapid Charger charges packs up to 40% faster, reducing downtime and maximizing productivity. The M18 FUEL 7-1/4 inch Circular Saw Cuts Faster and Weighs up to 40% less than corded saws, while delivering 2X more run-time than other 18-Volt cordless circular saws. Designed for the carpenter, remodeler and general contractor the M18 FUEL 7-1/4" Circular Saw from Milwaukee delivers the power of a 15A corded saw, cuts faster than a 15A corded saw and gives users up to 750 cuts per charge. The POWERSTATE Brushless Motor provides 5,800 RPM and higher speeds under load for corded cutting performance. REDLINK PLUS intelligence ensures maximum performance and protection from overload, overheating and over discharge. The M18 REDLITHIUM High Output HD12.0 battery delivers unmatched run-time in all applications. All magnesium guards and shoe delivers extreme durability for jobsite conditions. A built-in rafter hook offers quick and easy storage and an electric brake stops the blade quickly after cuts are complete for maximum productivity. 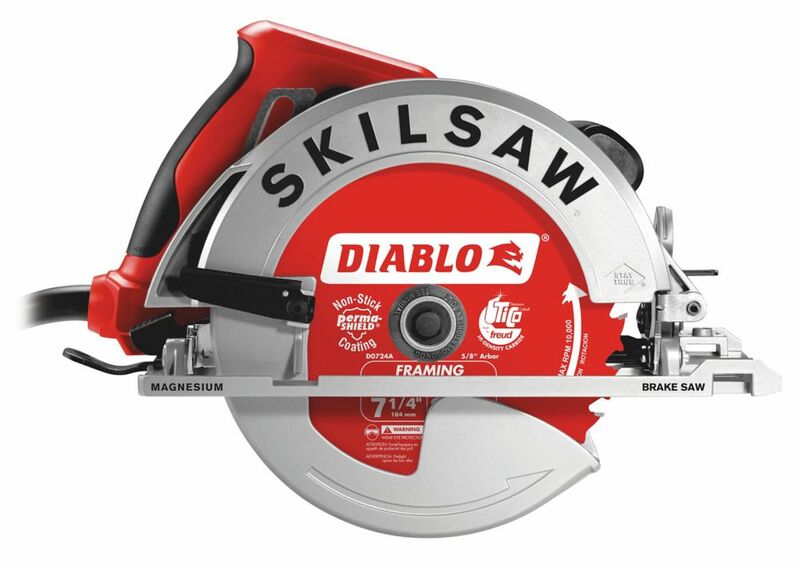 15 Amp 7-1/4 inch Magnesium SIDEWINDERCircular Saw with Brake and 24-Tooth Diablo Carbide Blade The SKILSAW SIDEWINDER is the only circular saw with a convenience brake and all magnesium housing. The electric brake quickly stops the blade so you're ready for your next cut, making you more productive while the rugged magnesium motor housing keeps the motor cooler to give you powerful performance for a lifetime. Legendary SKILSAW worm drive inspired technology has been integrated into this SIDEWINDER with our best-in-class Dual-Field Motor to provide reliability and durability. Top it off with a brake and the 56 degree precision beveling capacity and you will be unstoppable. It also comes with a Diablo blade so it's ready to work hard, out of the box. 15 Amp 7-1/4 inch Magnesium SIDEWINDERCircular Saw with Brake and 24-Tooth Diablo Carbide Blade is rated 5.0 out of 5 by 4. Rated 5 out of 5 by Badger from This saw is very powerful, balanced and weighted perfectly. I give this saw 2 thumbs up! This saw is very powerful, balanced and weighted perfectly. I give this saw 2 thumbs up! Rated 5 out of 5 by DIY Jimmy from Excellent buy!!! I really like the feel of this saw. Ergonomically designed and felt comfortable while working tool. (In the hand and lightweight to the feel) I usually like to purchase and use tools with the features of the brake stop.... Increases productivity while also increases the safety factor. Safety never takes a day off!! Cuts smooth and recommended for not only the rough finish carpenter, but as the finish/trim work as well. Rated 5 out of 5 by StanH from I bought the SkilSaw SPT67WMD-22 with the electric brake. A little more than a pound heavier than... I bought the SkilSaw SPT67WMD-22 with the electric brake. A little more than a pound heavier than the non-brake model but doesn't matter as this saw is so well balanced. Just tried a sample cut of a 2x4: can't feel any resistance from the wood - like cutting air. This saw is so smooth and powerful; great hand feel. Love the engraved and accurate depth markings; magnesium motor housing; handle position; accurate kerf markers; not to mention the fact that it effectively blows sawdust away from the cut line and apparently the operator; also 90 degrees square right out of the box (and even if it weren't there is an easy adjustment screw available). As to the brake, it stops the blade in 3-4 seconds and doesn't cause any inertial movement from a sudden stop. The blade guard is very unobtrusive and doesn't drag or stick in the slightest. This saw just exudes quality and robustness. The designers included all the necessary features and stripped out the fluff (like lights and laser guides, for example). I can't find anything to complain about except maybe lack of a case (solved with a Bosch L-Boxx 3 which fits the SkilSaw perfectly). Rated 5 out of 5 by SteveL from This machine is everything that it is advertised, and then some. Love the measured depth cutting ... This machine is everything that it is advertised, and then some. Love the measured depth cutting guide.